Today we are just posting a short reminder that update 2.51 has gone live. To download, all you will need to do is start the game through the launcher as usual, and it will handle the rest. New players can grab the launcher here. That's all for today, but be sure to come back next time for another update. Until then, feel free to visit our IRC channel, our public forums, and/or our Twitter and Facebook pages to discuss this update and other news. New players can grab the launcher here. This update fixes several bugs in the python error reporting code, a tiny bug on the map Seelow Heights and the new deployable weapon markers being visible to the enemy team. There are also some minor optimisations to Sammatus. For server administrators, the 2.51 server files can be found here. Update: files downloaded before this edit are not working, please re-download the new version 3.1.735. 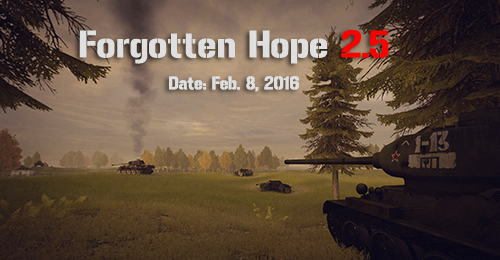 We are pleased to announce that Forgotten Hope 2.5 is now live! You can download it by starting the Launcher. New and returning players can download the launcher from our downloads page. We hope to see you on the battlefield! This is just a quick update to give server administrators the files they need to get their servers set up and running in time for the release of 2.5. You can find these files here. You do not need to download these files unless you administer a server. The files required to play 2.5 will be available through the Launcher tomorrow. That's all for today, but be sure to come back tomorrow for the big release. Until then, feel free to visit our IRC channel, our public forums, and/or our Twitter and Facebook pages to discuss this update and other news. There have been a number of improvements made to some of the gameplay mechanics. Most notably to the artillery spotting system. You will now be able to see the name of your spotter, and the system will prefer to automatically change to a new spot made by the same spotter instead of just the next spot in the queue. Additionally, there is a new camera position for mobile artillery and the behaviour of all artillery cameras has been improved. A new push variant called Adaptive Push has been added. In this mode you will be able to bypass flags that normally would need to be captured to advance. These pocket flags will become isolated and easy to overrun - but watch out, the defenders will have a 60 second window to recapture it so make sure it is secure before moving on! You'll find this mode on Battle of Brest and Pegasus. Even though Finland was a small nation of 4 million inhabitants, it fought three distinct wars during World War 2 and managed to defend its independence in the post war world, in stark contrast to other nations in the Soviet sphere of influence. The first one, the Winter War, was fought in 1939 and 1940 against an overwhelming Soviet invasion and ended with the loss of territory to Russia. The Continuation War of 1941 saw Finland fight at the side of Germany in order to regain these regions, making it the only democracy in the Axis camp. In September 1944 Finland signed a separate peace with the Soviets, on the condition that they expel all German forces from their territory. This was achieved in the Lapland war, raging until early 1945. 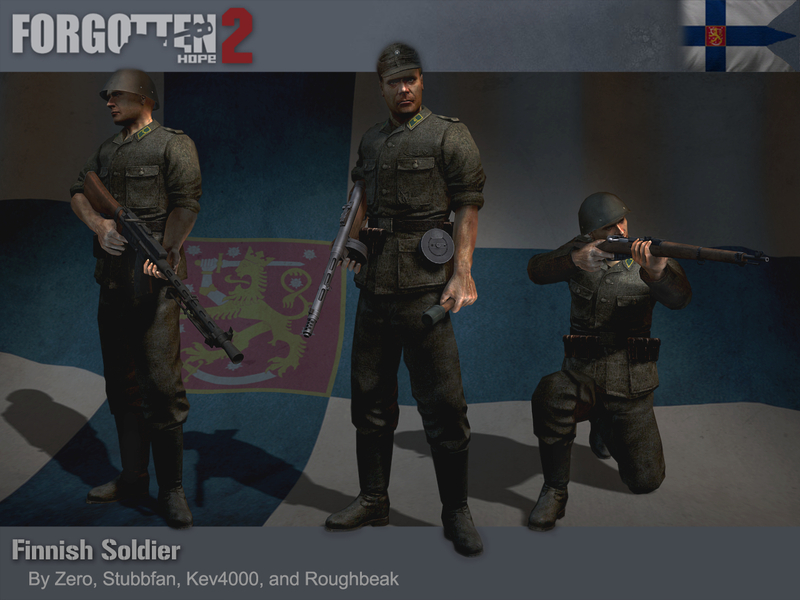 Our Finnish Army playermodels were made by the combined efforts of Zero, Stubbfan, Kev4000 and Roughbeak. Ts4EVER has also posted a nice overview of the 5 maps featured in this update, check out his devblog here. It has been quite a while since we have had the pleasure to write a Road to... news update, and we'd like to thank all of our fans for continuing to support us over the last year and a half. We think that version 2.5 is the most polished release we've made to date. There have been uncountable numbers of small bugs squashed and there is barely any vehicle, weapon or map that hasn't seen some improvements. We'd like to extend a big thank you to all our fans for their continued support and of course for playing our mod, to our betatesters for their dedication to improving our work, to our developers for the time and effort they put in to make things happen, and to Fluestertuete for providing the web hosting that makes this all possible. We'd also like to extend a special thank you to Archimonday and Harmonikator for their work on new animations, Hybrid and Kubador for their work on new sounds, Matt Baker for his work on new textures, Gavrant for his single handed mission to squash every last imperfection, and Jan Kurator for his single handed mission to give Gavrant more work. Finally, we'd like to thank the teams at WAW, Forgotten Honor and  for keeping our community together. Now, perhaps the most important change in 2.5 considering recent events is we will be changing over to a new master server. This change is in fact the trigger for this release - we had originally intended to polish out the last few rough imperfections - but we decided that getting everyone playing again outweighed the benefits of this final work. Because of this rather unusual situation we have found ourselves in we cannot give you an exact time for the release, but we are aiming to get everything ready for Monday (8th) evening. Just as soon as we know when the exact time is we'll let you know as well. The KV-1 heavy tank had suffered from low mobility, greater cost and yet the same armament as the T-34 medium tanks. While the KV-1S solved some of these issues, it got rid of the thick armour that was the KV-1's main advantage. The introduction of the Tiger spurred the design of a new heavy tank, to be armed with the 85mm gun from the SU-85 tank destroyer. With first the stopgap KV-85 and then the production IS-1, the Red Army found itself with a capable heavy tank that could take on the German Tigers on a more even footing. With the switch to the T-34-85 the situation again returned to a heavy and medium tank with the same armament. The decision was taken to up-gun the IS to either the D-10 100mm or the A-19 122m. While the D-10 had the better armour penetration ability, the A-19 won the competition with its larger high explosive shell and ready availability. The IS-2 started production in November 1943, and would feature prominently in the Soviet offensives of 1944 and 45. It had the armour to stand toe to toe with most German tanks, and the gun to match. It wasn't perfect though: the two part ammunition led to long reload times and a low capacity of 28 rounds, while the engine guzzled fuel and mechanical reliability was low. There was an improvement made to the hull armour in mid 1944 along with an improved gun. 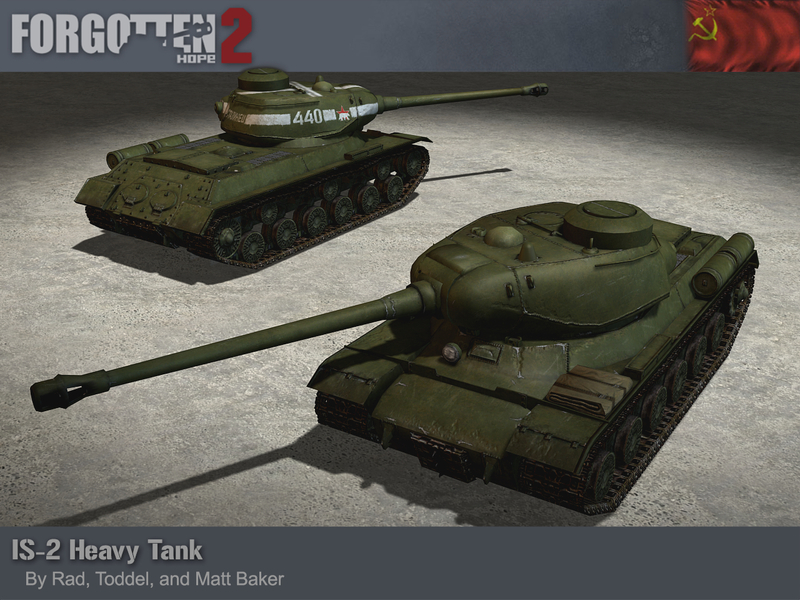 Our IS-2 was made by Rad for the original Forgotten Hope, with Toddel and Matt Baker providing the update to FH2 standards. The Red Army had been formed following the 1917 revolution, and was almost immediately called into fighting both the Polish-Soviet War and the Russian Civil War. Any lessons learned from these conflicts were brushed aside in the 1937-39 Great Purge, which saw great numbers of competent officers removed from their posts. The poor leadership in the wake of this lead to the crushing losses suffered in the Winter War and Operation Barbarossa. Lessons were soon learned, and the Red Army was soon an effective fighting force again. Over 34 million men would serve in the Red Army during the Great Patriotic War, and over 11 million of those were killed or captured. 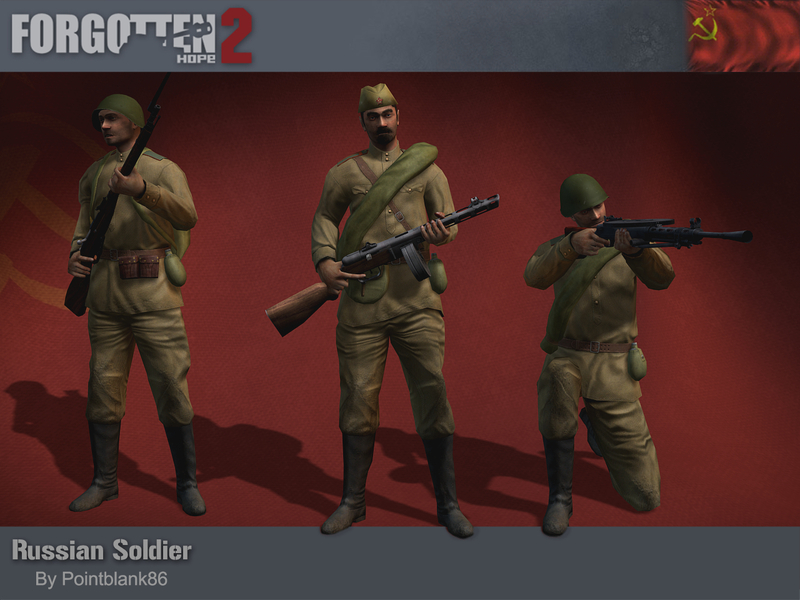 Our Soviet playermodels were made by Pointblank86, and are seen in the render armed with the Mosin Nagant, PPSh and DP made by Seth Soldier. That's all for today, but be sure to come back tomorrow for another update. Until then, feel free to visit our IRC channel, our public forums, and/or our Twitter and Facebook pages to discuss this update and other news. As most of you are probably aware, the account server is currently down since the weekend as the result of repeated denial of service attacks on Project Reality's server infrastructure. Because these attacks are still going on, we are now looking into providing an alternative master server. We don't have an exact time frame for this yet, but we hope it will not be long and will inform you of any progress.